Designed for kids – no confusing menus or navigation. 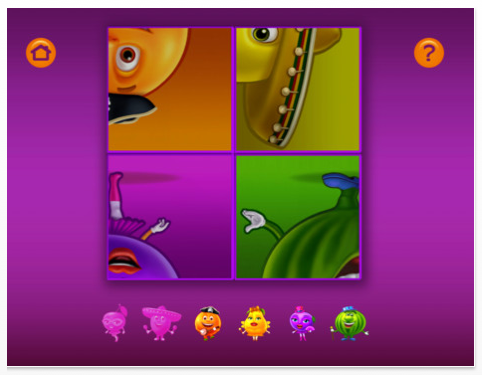 This cube puzzle game provides a higher level visual spatial skill to rotate and flip the puzzle pictures to assemble the puzzle correctly. It takes some getting used to do the rotating and is rather touchy, requiring good graded control to rotate the pieces to obtain the correct orientation. 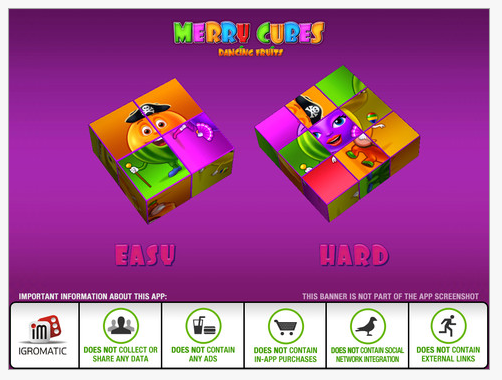 The app provides options of Easy (4 cubes) and Hard (6 cubes) puzzle levels. Merry Cubes provides music in the background which has no on or off within the app (just decrease or mute the volume control) which may or not be annoying to users. 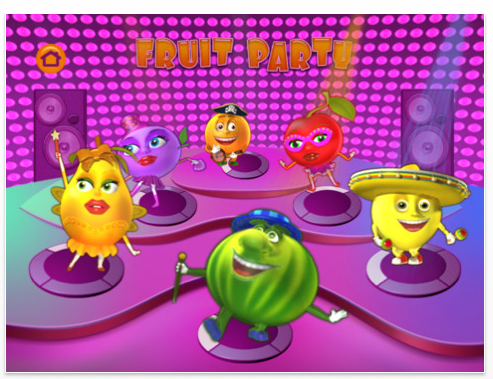 When you complete the assembly correctly it does provide a quick dancing fruit reward. This app is certainly not for every child, it requires graded control to perform controlled rotation of the pieces and a high level perceptual ability to spatially orient the puzzle piece in your head to attain correct orientation. It could be an appropriate app for students with good fine motor control needing higher level visual spatial activities than the standard puzzle assembly. It provides similar demand to tanagram activities requiring rotation and translation of the pieces to complete a design. Although it states the app is good for fine motor skills, it does require some more advance two-fingered rotational finger movements to rotate pieces but, as many iPad apps the fine motor demands are limited in a 2D activity. If the need for fine motor skills exist, use of the 3-D, real cube blocks will best suit development of fine motor skills such as in hand manipulation skills and haptic abilities associated with manipulating real objects. If you have questions about fine motor skill development, consult a OT who can provide more information on improving fine motor development. Check it out to see if it would benefit any of your students or patients would benefit from this app. I searched for other apps that might be similar to this app for a comparison and did not find any comparable apps. If it sounds like it could be something that provides a different needed skill for your students, it might provide a visual spatial app for your OT iTool Kit. What other visual spatial apps do you use? This entry was posted in App Reviews, Apps for OT's, Apps for Special Needs, iPad, Occupational Therapy, Special education, Special Needs, Uncategorized, Visual Perception and tagged App Review, iPad, occupational therapy, OT Apps, special education, Visual Perception. Bookmark the permalink. Thanks much! I actually work with older students so I don’t explore apps for younger students! I am familiar with some of their early developed apps but it is hard to keep up- matter of fact it is impossible! Thanks I will post your suggestions and the myfirstapps.com website. I hope you don’t mind if I post your name for credit where credit is due! What a value to have the recommendations from the experience of others!! Check out Diane Novatnik’s recommendations in the next post! Nice apps new to me! Dear Carol, I am the developer of Merry Cubes (MobileIgromatic). It was great pleasure to get to know you find our app useful. Thanks! Thank you for the visit and reply!